Posted on October 21, 2016 by Billy S.
Keeping track of your Formsite account can be challenging at times, especially if you have multiple people using the same account or if you have Sub-users. Luckily there’s a built-in page that tracks the major actions in your account located on the User menu -> Log page. A single-user Formsite account will usually not need to refer to it, but accounts with multiple users and/or Sub-users can find it useful for keeping track of user actions. The log is typically not needed unless you need to find out when a form was made or when results were deleted. For example, the log will track when users access the account and record the date, time, and IP address every time the user logs in. All significant account actions are recorded and assigned to each user, also, which is helpful when tracking down major account events. Sub-users are listed by their usernames to make it easy to attribute account events. Sub-users with admin permissions are able to see the log while limited-permission sub-users cannot, so protecting the account actions can be done by controlling sub-user permissions. 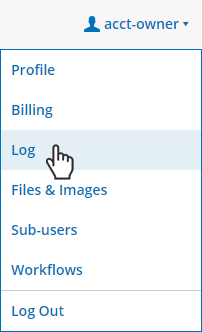 Logins: Every time someone logs in to your account their information is recorded in the log. This is useful when tracking down changes or results modifications when you know the approximate date and time. Form events: Logged events include creating new forms, renaming forms, and deleting forms. If you need to refer back in your form’s history, this is the place to go. Deleted forms & results: You may have a reason to find a previously-deleted form or result, and locating in the log is as easy as using your browser’s search function to locate the name and/or number. Tip: If you don’t find it right away, see the next section to expand your log entries to earlier dates. Feel free to change the number until you can see the date or event you’re looking for.